Hypertension, more precisely, systemic arterial hypertension is one of the most prevalent non-communicable diseases worldwide. High blood pressure is the most common modifiable risk factor for cardiovascular morbidity and mortality. Being a chronic condition, it requires a lifelong management to keep the blood pressure and its resultant life-threatening complications under control. Its toll on the economic state of a nation is also of serious concern that prompt action has to be undertaken to curb hypertension with effective health care policies. Recently, the "2014 Evidence-Based Guideline for the Management of High Blood Pressure in Adults", put forth by the panel members appointed to the Eighth Joint National Committee (JNC 8), was released. This review focuses on the current strategies to manage hypertension with input from the latest guidelines around the globe such as, the 2014 JNC 8 Guidelines, the 2013 European Society of Hypertension/ European Society of Cardiology [ESH/ ESC] Guidelines, the 2011 National Institute for Health and Clinical Excellence [NICE] Guidelines and the 2013 Indian Guidelines on Hypertension [I.G.H.-III]. Hypertension is the most common controllable disease affecting around 40% of the adult population worldwide. It is also the most common condition encountered by a physician in primary care setup. Currently, almost 1 billion people are hypertensive, and it is estimated that in 2025, nearly 1.56 billion persons i.e. two-thirds of the world's population would be inflicted with this chronic ailment. Hypertension is a "silent killer" accounting for a substantial amount of morbidity and mortality worldwide, which is preventable. Hypertension is reported to be the fourth contributor to premature mortality in developed countries and the seventh in developing countries. Almost 12.8% (7.5 million) of the total deaths and around 3.7% of the total DALYS (disability adjusted life years) are due to raised blood pressure (BP) [1,2]. Hypertension can also be proclaimed as an "iceberg" disease as only about half of the hypertensive subjects in the general population of most developed countries were aware of the disease, only about half of those aware of the problem were being treated and only about half of those treated were considered adequately treated . End-organ damage leading to cardiovascular (CV) events affecting the heart, brain and kidneys are commonly encountered. It has been postulated that 54% of strokes (ischemic and hemorrhagic) and 47% of ischaemic heart diseases are attributable to high BP. And by means of several RCTs, the true value of pharmacotherapy for hypertension (HT) in reducing important health outcomes in hypertensive patients is overemphasized. Hence it is high time to find novel ways and means to overhaul HT and all its lethal consequences . The sinister sobriquet of "silent killer" stays true even for Indian population, as only about half (55%) of the hypertensive patients were aware of their disease state, only a third (36%) of these known hypertensive subjects were under treatment and furthermore only a quarter (28.2%) of this treatment group had their BP values under control. Recent epidemiological data suggest both an increase in the prevalence (urban: 25% and rural: 10-15%) and poor levels of control of hypertension in India [2,4]. Blood pressure is created by the force of blood pushing against the walls of blood vessels (arteries) as it is pumped by the heart. BP is a multiplication product of cardiac output and peripheral vascular resistance . 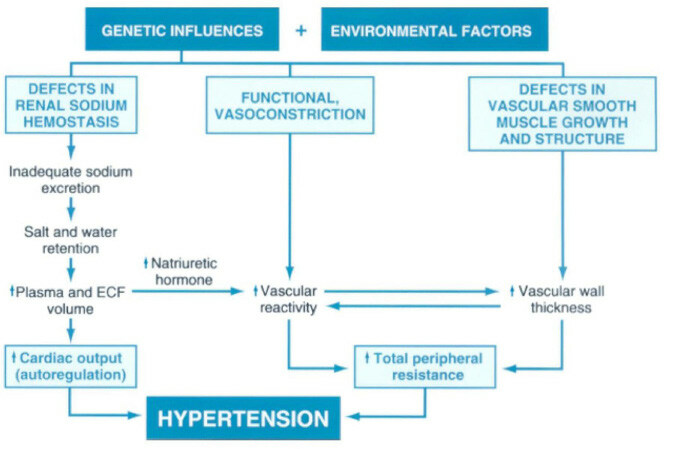 Cardiac output and peripheral vascular resistance are determined by interaction of multiple factors like genetic, environmental, and demographic factors. Hence, being a function of these variables, the BP level of an individual is indeed a complex characteristic. CO is mainly dependent on blood volume and PVR is determined chiefly by neural and hormonal factors acting at the level of the arterioles (Figures 1 and 2). In general clinical practice, the physicians encounter cases of hypertension for which no detectable lucid causes can be attributed for and also these cases constitute approximately 95% of the total cases of HT. These cases of hypertension come under the umbrella term of "essential hypertension" because of the view that high BP is sometimes "essential" to perfuse diseased and sclerotic arteries. But it is now accepted that the diseased and sclerotic arteries were most often due to the direct effect of HT and not the other way round; thus the term "essential hypertension" is a misnomer and the term "primary hypertension" is preferred (Figure 3). Sometimes, it also referred to as "idiopathic hypertension". The usual age of onset is between 25 to 50 years. The other set of 5% of hypertensive cases are termed "secondary hypertension" for which specific causes for the BP elevation can be identified (for example, renal parenchymal disease, renal artery stenosis, primary hyperaldosteronism, Cushing syndrome or phaeochromocytoma, or sleep apnea). Secondary hypertension develops at an early age or after the age of 50 years [7-10]. Hypertension rarely causes symptoms and hence is a silent killer as the people succumb easily to its imperceptible path. Sometimes symptoms like headache, dyspnoea, dizziness, chest pain, palpitations and epistaxis can be witnessed. It has been postulated that BP is normally distributed in the population and strictly speaking there cannot be a cut-off point above which "hypertension" definitively exists and below which, it does not. And epidemiological studies show a continuous relationship with blood pressure and subsequent development of high BP related diseases and for every 20/10 mmHg surges in BP, above 115/70 mmHg, the risk of CV events doubles. Though the demarcation between norm tension and hypertension is difficult, yet in common practice the physicians are in need of cut-off BP values to start therapy [2,7]. The 'gold standard' method of BP measurement using a mercury sphygmomanometer is no longer recommended due to environmental safety hazards caused by mercury-containing instruments. In 2005, Health Care without Harm (HCWH) and the WHO together took the initiative to reduce the demand of mercury-containing sphygmomanometers by at least 70% by the year 2017 . And the JNC 8 guidelines suggest the use of the oscillometric method of BP measurement with properly calibrated and validated automated digital devices. Environmental factors, especially increased salt intake, may potentiate the effects of genetic factors. The resultant increases in cardiac output and peripheral resistance contribute to hypertension. ECF, extracellular fluid . It is recommended that patients should be seated comfortably in a quiet and relaxed environment for at least 5 minutes in a chair rather than on an examination table, with feet flat on the floor, their back supported, and their arm supported at heart level. An appropriate-sized cuff (length of the cuff bladder should be at least 80% of the mid‐upper arm circumference) encircling the bare arm should be used to ensure accuracy. Patient should be advised to keep away from caffeine, cigarettes and physical activity for at least 30 minutes prior to measurement. At least 2 measurements should be made spaced 1 to 2 minutes apart. In the auscultatory method, phase I and phase V of Korotkoff sounds are marked as systolic and diastolic BP, respectively. For the purpose of establishing the diagnosis of hypertension and for further follow-up in attaining the BP goals, two to three measurements should be taken at each visit in the process outlined above, and the average of the readings should be recorded. Blood pressure should be measured in both arms at the first visit, and the arm with the higher BP should be used for subsequent measurements. The between-arms difference is deemed significant only when it is measured simultaneously rather than sequentially, and also the difference is more than 10 mmHg. Measurement of BP in the standing position (at 1 min and 3 min after assuming the standing posture) is indicated periodically, especially in the elderly and in the diabetic patients. 'Postural or orthostatic hypotension' is characterized by a reduction in SBP and DBP of more than 20 mmHg and 10 mmHg respectively within 3 minutes of standing [9,10]. As there was no further evidence to make a change to the previously established definition of high blood pressure or hypertension, the Panel members of JNC 8 support in continuing with the precious JNC 7 definition. The JNC 7 defines high blood pressure or hypertension as a SBP (systolic blood pressure) greater than or equal to 140 mmHg, a DBP (diastolic blood pressure) greater than or equal to 90 mmHg, or both in the setting of properly taken office measurements (Table 1) . The "2013 European Society of Hypertension/ European Society of Cardiology (ESH/ ESC) guidelines" is also persisting with cut-off values of 140 mmHg and 90 mmHg for SBP and DBP. The various categories are mentioned in the Table 2 . Clinic blood pressure is 140/90 mmHg or higher and subsequent ambulatory blood pressure monitoring (ABPM) daytime average or home blood pressure monitoring (HBPM) average blood pressure is 135/85 mmHg or higher. Clinic blood pressure is 160/100 mmHg or higher and subsequent ABPM daytime average or HBPM average blood pressure is 150/95 mmHg or higher. Clinic systolic blood pressure is 180 mmHg or higher, or clinic diastolic blood pressure is 110 mmHg or higher. The Indian Guidelines on Hypertension (I.G.H. )-III released on February, 2013 endorsed by the "The Association of Physicians of India" defined hypertension in adults aged 18 years and older as 'SBP of 140 mmHg or greater and/or DBP of 90 mmHg or greater or any level of blood pressure in patients taking antihypertensive medication' (Table 3) . Due to better reliability, in recent years, the 'out-of-office' measurement of BP has gained significance, which is usually assessed by 'ambulatory blood pressure monitoring' (ABPM) or 'home blood pressure monitoring' (HBPM). Though HBPM is more suited in a primary setup and ABPM in a specialist centre, they should be regarded as complementary rather than as an alternative to each other (Table 4). But the major deciding factor in these methods is the calibration process as the devices used for measuring should be evaluated and validated according to international standardized protocols. The values of these 'out-of-office' BP measurements are better correlated with the CV morbidity and mortality than the 'office' or 'clinic' BP measurement (Table 5). Hence both ABPM and HBPM are more prognostically significant . In ABPM, the night-to-day BP ratio represents the ratio between average nighttime and daytime BP. The normal decrease in BP during the night is defined as 'dipping'. It has been purported that the patients with a comparatively lesser drop at night are prone to CV events, especially thrombotic strokes. And also patients with accentuation of the normal morning rise are more prone to hemorrhagic strokes [9,10]. It should be remembered that both HBPM and ABPM act as adjuncts to the conventional office BP measurement (clinic BP measurement [CBPM]) which is still regarded as the 'gold standard' for screening, diagnosis and management of hypertension [7,9]. White-coat (Isolated office/ clinic) HT [WCH]: Due to a state of situational anxiety, which can be an alerting response, the value of office BP can be comparatively more than that measured out of the office. This is called the 'white-coat effect', although inappropriately. But the term 'white-coat HT' is ascribed only when there is a sustained elevation of BP in the office at repeated visits with normal BP values out of the office. Use of ABPM or HBPM is justified for the evaluation of WCH [7-9]. Masked (Isolated ambulatory) HT: Masked HT, on the other hand, defined as a normal office BP with abnormally high BP out of the medical setting. Individuals with 'masked HT' are more prone to organ damage (OD) and at increased risk of CV events than normotensive persons . True/ consistent normotension & Sustained HT: When both the office and out-of-office BP measurements are consistently normal or high, they are referred to as "true norm tension" and "sustained HT", respectively . Hypertensive urgency/ emergency: "Hypertensive emergency" is defined as a state of elevated BP values of SBP or DBP, above 180 mmHg or 120 mmHg, respectively with accompanying end organ damages (OD) such as major neurological changes, hypertensive encephalopathy, cerebral infarction, intracranial hemorrhage, acute LV failure, acute pulmonary oedema, aortic dissection, renal failure, or eclampsia. "Hypertensive urgency" is characterized by isolated large BP elevations without acute OD. Though parenteral drug therapy is generally not necessary in urgencies, both hypertensive emergencies and urgencies require the usage of intravenous agents like labetalol, sodium nitroprusside, nicardipine, nitrates and furosemide to bring down the BP. It is always recommended decreasing the BP levels gradually, and not more than 25% of BP reduction is entertained in the initial few hours [8,9]. It has been proved by way of a large number of RCTs that by lowering the blood pressure values in hypertensive subjects the subsequent complications of HT can be reduced. Though some trials depict superiority of one class of antihypertensive drug over other types, meta-analyses from trials of larger sample size have failed to show clinically significant differences between drug classes and hence the beneficial effects of BP lowering is largely independent of the drugs employed [8,9]. On December 18th, 2013, the panel members appointed to the eighth Joint National Committee published online the "2014 Evidence-Based Guideline for the management of High Blood Pressure in Adults" in JAMA (The Journal of the American Medical Association). JNC 8 is unique in the sense, as the clinical recommendations by this guideline were based on randomized controlled trials (RCTs) which are considered 'gold-standard' in representing the scientific evidence generated. Thus, "JNC 8 Guideline" is indeed an evidence-based systematic review of well-designed and well-executed RCTs. A panel of 17 members was selected based on their expertise in varied fields from more than 400 nominations. Initially, they developed 23 questions from which they ranked the top 5 questions which were felt to be of highest priority. On further discussion, they narrowed down to three questions with highest ranks. And this report of JNC 8 is based on these three highest-ranked questions. 1. Among adults with hypertension, does initiating antihypertensive pharmacologic therapy at specific BP thresholds improve health outcomes? 2. Among adults with hypertension, does treatment with antihypertensive pharmacologic therapy to a specified BP goal leads to improvement in health outcomes? 3. In adults with hypertension, do various antihypertensive drugs or drug classes differ in comparative benefits and harms on specific health outcomes? These research questions were derived based on a standardized framework known as PICOTSS, which stands for Person or Population, Intervention or exposure, Comparator, Outcome, Timing, Setting and Study designs. Hence, all these highest priority questions were structured in such a way that either the statement or the inclusion and exclusion criteria (I/E criteria) of each question satisfied the aforementioned PICOTSS criteria. By way of reviewing original research articles of eligible RCTs from January 1, 1966 to December 31, 2009, the panel members gathered 48 evidence statements to answer the three highest-ranked critical questions. The responses to these questions were collated as the recommendations of JNC 8. Out of the nine clinical recommendations, the first 5 address questions 1 and 2 regarding the thresholds and goals for BP management. Question 3 regarding the choice of antihypertensive drugs is addressed by the next three recommendations (i.e. recommendations 6, 7& 8). The last recommendation (9) is a summary of strategies for starting and adding antihypertensive drugs. The panel members not only voted for these recommendations but also graded the same based on the strength of each recommendation (Table 6). The recommendation grading system used in this guideline was developed by the National Heart, Lung, and Blood Institute's (NHLBI's) Evidence‐Based Methodology Lead team. There is high certainty based on evidence that the net benefit* is substantial. that the net benefit is moderate. There is at least moderate certainty based on evidence that it has no net benefit or that risks/harms outweigh benefits. make a recommendation. Further research is recommended in this area. research is recommended in this area. As discussed before, the recommendations 1 to 5 emphasize on the thresholds and goals of hypertensive management(Table 7). Recommendations 6, 7 and 8 shined light upon the medication use in hypertension management (Table 8). The 9th recommendation focuses on dosing strategies to attain and maintain the goal BP. It is given as, "If goal BP is not reached within a month of treatment, increase the dose of the initial drug or add a second drug from one of the classes in recommendation 6 (thiazide‐type diuretic, CCB, ACEI, or ARB). The clinician should continue to assess BP and adjust the treatment regimen until goal BP is reached. If goal BP cannot be reached with 2 drugs, add and titrate a third drug from the list provided. Do not use an ACEI and an ARB together in the same patient. If goal BP cannot be reached using only the drugs in recommendation 6 because of a contraindication or the need to use more than 3 drugs to reach goal BP, antihypertensive drugs from other classes can be used. Referral to a hypertension specialist may be indicated for patients in whom goal BP cannot be attained using the above strategy or for the management of complicated patients for whom additional clinical consultation is needed". This last recommendation is distinctive from other recommendations as it was not developed in response to the three critical questions but rather to assist in the implementation of the other 8 recommendations. It is just an expert opinion from the panel members as there was insufficient evidence or evidence is unclear or conflicting regarding the dosing strategies. The panel members also gave expert opinion on three varied strategies based on the approaches used in different RCTs with about dosing regimens of the antihypertensives (Table 9). In all these strategies it is recommended to titrate the dose of each drug every month up to the maximum recommended dose, so as to attain the goal BP. The initial and target dose ranges are as in the Table 10. For both safe and efficacious short and long term treatment of hypertension, rational combinations of drugs at appropriate doses have to be chosen. Fixed dose combinations (FDCs) are advised when more than one drug are to be used to control BP, as it improves compliance. Longer acting drugs are preferred for the ease of once daily administration which in turn also improves adherence to treatment. Though the antihypertensive medications have to be continued lifelong, the physician should consider lowering both the dosage and/ or number of drugs after attainment of effective control of HT, which is called as the "step-down therapy" . The 2013 ESH/ESC guidelines delineate 'resistant hypertension' as "despite usage of appropriate lifestyle measures plus a diuretic and two other antihypertensive drugs belonging to different classes at adequate doses (but not necessarily including a mineralocorticoid receptor antagonist) fails to lower SBP and DBP values to < 140 and 90 mmHg, respectively". Certain intricate procedures can overhaul systemic HT which is 'resistant' and unyielding to the varying drugs available. The renal sympathetic nerve fibres encircling the renal arteries are subjected to radiofrequency ablation and consequently the kidneys loose the autonomic control over the blood pressure. Previously it required more invasive procedure but nowadays minimally invasive catheter-based procedures are preferred. In this process, an intra-arterial catheter is inserted percutaneously so as to reach the desired site. 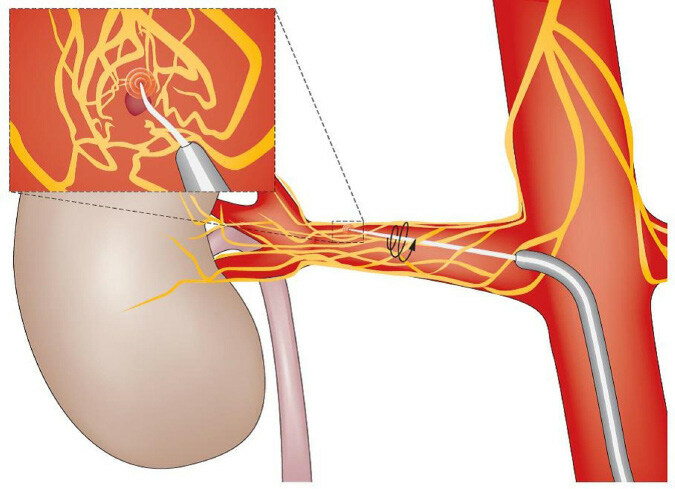 Once in the region of the renal arteries the catheter is activated (Figure 4). Renal denervation (RDN) by chemical ablation with the help of locally applied vincristine was suggested as an option for 'resistant' hypertension. But the superiority of this mode of therapy over radiofrequency ablation is not certain due to lack of sufficient data. In baroreflex activation therapy, an implanted device stimulates the baroreceptors in the vicinity of the carotid sinus. This stimulus leads to false information of increased BP, which is in turn sensed by the BP control centres thereby causing a reflex fall in BP. These device-based approaches, though invoke interest in an inquisitive physician, are laden with technical difficulties in the implantation procedure. Hence, after appropriate improvements both in the device setup and the surgical process, these interventions can be ventured more confidently. Other therapies like yoga (Shavasana), meditation and bio-feedback have found to reduce BP values. But their actual role in HT management remains obscure . The panel members of the JNC 8 endorsed the lifestyle recommendations put forth by the "2013 Lifestyle Working Group" (Table 11) . The primary motive of this "Lifestyle Working Group" was to figure out the effects of diet and physical activity on cardiovascular risk factors, and high BP is in itself one of the major risk factors (Table 8). The '2013 ESH/ESC guidelines' and the '2013 Indian guidelines' also reflect the "Lifestyle Working Group" suggestions as follows, (i) salt restriction, (ii) moderation of alcohol consumption, (iii) high consumption of vegetables and fruits and low-fat and other types of diet, (iv) weight reduction and maintenance and (v) regular physical exercise. All these recommendations are based on evidences that are of high quality. Since more than 80% of salt consumption is 'hidden' which is ingested along with baked, processed and preserved food items, more emphasis should be on curtailment of these high-salt foods. As a whole, the diet in hypertensives should contain fewer calories, a lesser amount of fat and salt, with normal protein levels. With regard to alcohol consumption, no more than 30g and 20g of ethanol per day for men and women, respectively, are advised. The Indian guidelines recommend maintaining an ideal body mass index of less than 23 kg/m2. Total abstinence from smoking or usage of tobacco in any form is obligatory for overall CV risk reduction. therapy for other medical conditions (including diabetes mellitus). Both aerobic and resistance exercises are found to be significantly reduce systolic and diastolic blood pressures. Several exercise regimens including isometric resistance exercise, dynamic aerobic exercise and dynamic resistance exercisecan be practiced to optimally control elevated blood pressure. It has been recommended that 50 to 60 minutes of moderate intensity exercise three or four times per week may result in short term reductions in blood pressure of 5 to 10 mmHg. These lifestyle changes play a vital role in the prevention of the development of high BP and also in the management of HT. Once initiated the prime focus should be on the adherence to these lifestyle modifications as they have to be followed lifelong, along with the conventional pharmacotherapy [2,8,9,11]. 3. To identify other cardiovascular risk factors or concomitant disorders that may define prognosis and guide treatment. These objectives can be accomplished by a detailed medical history, appropriate physical examination and laboratory tests. The overall risk of each patient should be assessed before initiating treatment like the presence or absence of additional risk factors, the extent of target organ damage and other associated clinical conditions. As based on this overall risk, the treatment thresholds for initiation of drug therapy may change [7,11]. Hypertension though is one of the major cardiovascular risk factors its role in both CV morbidity and mortality is not independent of other factors (Table 12). And also the presence of other concomitant risk factors potentiates the effects of high BP on the health outcomes as a whole. Hence it is important to quantify the CV risk factors in to, and there are many CV risk assessment models which help in ascertaining this parameter. One such model is the Systematic Coronary Risk Evaluation (SCORE) which estimates the risk of dying from CVD over 10 years based on age, gender, smoking habits, total cholesterol and SBP. This SCORE model can be calibrated based on individual countries and currently this has been done for numerous European countries. Among all the factors age is considered to be one of the major risk factors involved as its influence on both the CV risk and the management plan is very enormous. This CV risk assessment is very much essential in the management of hypertension because of its implication in cost-effectiveness. And the relationship between BP and CV events is continuous, consistent, and independent of other risk factors [8,9]. CKD with eGFR<30 mL/min/1.73m2 (BSA); proteinuria (>300 mg/24 h). Currently, each class of anti-hypertensive agents contains several drugs; yet the search for innovative drug molecules with novel mechanisms of action is still ongoing as almost 30% of the hypertensive subjects are inadequately controlled with current established medications. New drug targets at the level of renin-angiotensin-aldosterone system (RAAS) are constantly explored in the industry. Despite the birth of many first-in-class antihypertensive compounds with a new mechanism of drug action (Table 13), the drugs that will make it into actual clinical practice are still unpredictable. Very recently, genetic technology like usage of RNA interference (RNAi) targeting hypertension-related genes is being investigated. Among the drugs in trials, the aldosterone synthesis inhibitors have better prospects in making significant alteration in the treatment of HT. However, persistent efforts are very much necessary in getting these new drugs reach the drug market rapidly so as to benefit the patients at large [12,14]. 'Hypertension' is indeed a major public health problem accounting for drastic downward shifts in the economic progress of a country. That too in a country like India, the impact of this dreadful disease on the healthcare system as a whole is humongous. Figures portray that about Rs. 43 billion of the annual income among the adult working class in our country is spent for the management of HT. Suboptimal control of BP is the most common attributable risk for death worldwide. HT goals can be achieved and maintained only by a team-based approach with aid from all health personnel like general physicians, medical specialists, trained nurses, dieticians and pharmacists. Moreover, studies have shown the significance of multi-disciplinary approach in the management of HT. Emphasis should also be on strict lifestyle modifications which act as the cornerstone for prevention and treatment of HT. Adhering to a particular guideline from an organization may not be always possible as the circumstances at the point of care of HT may vary. Hence, treatment plans can be customized, with slight moderations from the authenticate guidelines, in accordance with the facilities available in a particular setup, from primary care to a tertiary care hospital. Hence, it should be borne in mind that a physician should give more importance to his/ her clinical judgment whenever needed. At times, there occurs a state of 'clinical/ therapeutic inertia' wherein the physician fails to titrate or combine medications based on the individual patient's clinical responses. This state of 'clinical inertia', rather 'physician inertia' should be addressed to by prompt monitoring and follow-up of the cases. Moreover, it is much harder to convince patients to continue taking sometimes expensive drugs for an asymptomatic disease. Thus, the onus is on all the health care providers, which include the policy makers, who should keep their mind broad so as take timely and appropriate decisions to overcome all the illfated effects of this "Invisible Killer"-the Hypertension. Victor RG (2012) Arterial hypertension, Goldman's Cecil Medicine. 24th ed, Goldman L, Schafer AI, Elsevier Saunders. Special issue on Indian guidelines on hypertension (I.G.H.)-III. (2013) 61. Park K (2009) Epidemiology of chronic non-communicable diseases and conditions, Park's Textbook of Preventive and Social Medicine, 20th ed, Banarsidas Bhanot Publishers. Hypertension the silent killer (2014) (Weekend edition), 18th May The New Sunday Express Magazine: 1,2. Kumar V, Abbas AK, Fausto N (2005) Blood vessels, Robbins and cotran Pathologic Basis of Disease, 7th ed. 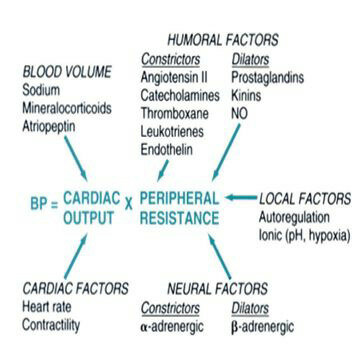 The critical roles of cardiac output and peripheral resistance in blood pressure regulation. Elsevier Saunders 527-9. Benowitz NL (2012) Antihypertensive agents, Basic and clinical pharmacology, 12th ed, Katzung BG, Master SB, Trevor AJ. Anatomic sites of blood pressure control. McGraw-Hill Companies 170. National Institute for Health and Care Excellence. Hypertension (CG127) (2011). Chobanian AV, Bakris GL, Black HR, Cushman WC, Green LA, et al. (2003) The seventh report of the Joint National Committee on Prevention, Detection, Evaluation, and Treatment of High Blood Pressure. JNC 7 report. JAMA 42: 1206-52. Mancia G, Fagard R, Narkiewicz K, Redόn J, Zanchetti A, et al. (2013) 2013 ESH/ESC guidelines for the management of arterial hypertension: the Task Force for the Management of Arterial Hypertension of the European Society of Hypertension (ESH) and of the European Society of Cardiology (ESC). Eur Heart J 34: 2159-219. Sutters M (2014) Systemic hypertension, Current Medical Diagnosis & Treatment, 53rd ed, Papadakis MA, Mcphee SJ. McGraw-Hill Education. James PA, Oparil S, Carter BL, Cushman WC, Dennison-Himmelfarb C, et al. (2014) 2014 Evidence-based guideline for the management of high blood pressure in adults. Report from the panel appointed to the Eighth Joint National Committee (JNC 8). JAMA 311: 507-20. Paulis L, Steckelings UM, Unger T (2012) Key advances in antihypertensive treatment. Nat Rev Cardiol 9: 276-85. Eckel RH, Jakicic JM, Ard JD, Hubbard VS, de Jesus JM, et al. (2014) 2013 AHA/ACC Guideline on Lifestyle Management to Reduce Cardiovascular Risk: A Report of the American College of Cardiology/American Heart Association Task Force on Practice Guidelines. Circulation 129: 76-99. 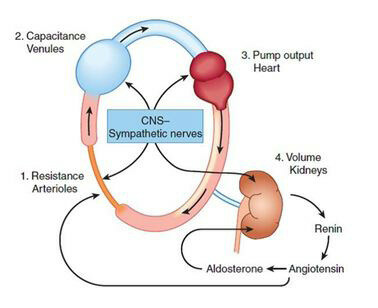 Monge M, Lorthioir A, Bobrie G, Azizi M (2013) New drug therapies interfering with the renin-angiotensin-aldosterone system for resistant hypertension. J Renin Angiotensin Aldosterone Syst 14: 285-9.